"If every word spoken in New York City daily were somehow to materialize as a snowflake, each day there would be a blizzard." The words of Kenneth Goldsmith(founder of UbuWeb), described by Juliana Spahr as 'the world's leading conceptual poet', and by himself as 'the most boring writer that has ever lived'. His ideas are being brought to the screen by artist and director Simon Morris in a film to premiere at the British Library in London on Friday 26th October. Christian Bök, one of Canada's leading poets and the winner of the 2002 Griffin poetry prize, said: "Goldsmith is our James Joyce for the 21st century." 'sucking on words' introduces 8000 of those daily words - a flurry of excitement as the climates of conflict and admiration come together around Goldsmith's pioneering conceptual poetics. Shot on location in Manhattan in February this year, 'sucking on words' features interviews with the leading critics and poets Bruce Andrews, Barbara Cole, and Robert Fitterman. Goldsmith says: "I'm more interested in knowing language better in the way Warhol was knowing image better by simply turning the camera on to it and letting it run." And Simon Morris adds: "Goldsmith is turning the literary world on its head by encouraging plagiarism and suggesting writers throw away existing notions of intellectual property." As Goldsmith says: "We don't need the new sentence, the old sentence re-framed is good enough." Conceptual writing is the poetics of the moment. It fuses avant-garde impulses of the twentieth century with technologies of the present. The material morphs between the web and the printed page. It draws attention to the materiality of the word and the conceptual nature of this type of literature - the writing is the idea and the idea is the writing. The lively conversations featured in the film are an ideal introduction to Goldsmith's witty and provocative works, already regarded as hallmarks of 21st century literature. In addition to debate and commentary, the film showcases readings from some of his most notorious books: No.111 (found phrases ending in an 'r' rhyme and filtered alphabetically by syllable count); Soliloquy (a transcription of every word Goldsmith spoke for a week); Day (a retyping of one day's New York Times); Traffic (a day's worth of hourly traffic bulletins); and The Weather (a year's worth of of radio weather bulletins). 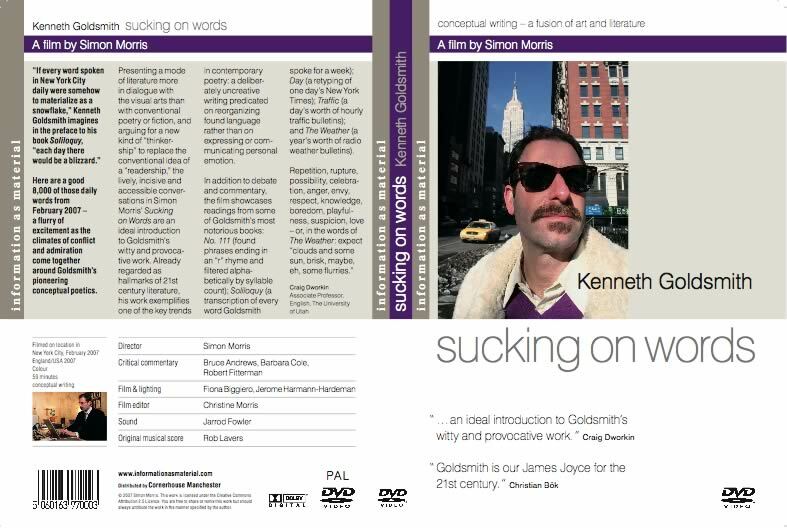 In November 'sucking on words' will have its Scandinavian premiere at the Oslo International Festival of Poetry. A screening is also taking place at Shandy Hall, Coxwold, near York, on Saturday 27th October, supported by the Laurence Sterne Trust where Goldsmith will be staying as poet-in-residence. Simon Morris says: "Oslo will provide us with the opportunity to bring the film to a much wider European audience, whereas Shandy Hall was where Laurence Sterne wrote his most celebrated work, The Life and Opinions of Tristram Shandy, Gentleman. It's fitting that one of the most famous contemporary avant-garde poets is to stay in the home of one of the 18th century's most experimental writers." Share 'Sucking on words' via karagarga(dead) or watch it at UbuWeb.